75mm x 75mm Gloss Yellow Vinyl Labels for Labelstation printers. 334 labels per roll. Shop Now! Gloss yellow vinyl labels with a permanent strong adhesive so the labels will stick to most clean dry surfaces. 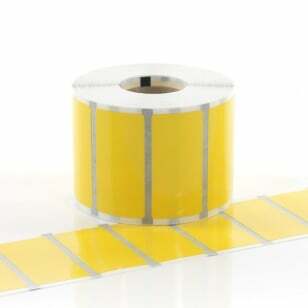 LabelStation Gloss Yellow Vinyl Labels are supplied on rolls and are ideal for a wide range labelling applications where a more durable label is required. Unlike standard paper labels, these vinyl labels are waterproof and weather resistant. When printed using the Industrial Print Ribbon there is a good degree of scratch and chemical resistance. The adhesive on these gloss yellow vinyl labels is an high tack and will adhere to most clean dry surfaces. Please note: We recommend the use of the LabelStation Industrial Print Ribbon for hardwearing labels or General Purpose Ribbon for shorter life labels.